The Angular 6 course has provided me with the momentum I needed to get started with web development. It has provided a solid base to understand some more advanced topics such as ES6, Typescript language features. The training has helped me in understanding how to create, build, and deploy the Angular applications using Angular CLI. Thanks to ZeoLearn for arranging this course at Houston. The trainer has got amazing teaching skills. This is a wonderful course to understand the Angular 6 concepts and practices. Since I am done with this course from Zeolearn, I am feeling pleased and confident after mastering Angular. If you really want to learn Angular coding this course by Zeolearn at Houston city is the boon for you. I have completed the course recently and feeling great after mastering it from Zeolearn. The trainer always tried to keep us up to date with the Angular concepts and guided us to move ahead in our career. Each and every concept and term is explained in detail. Really a great course if you want to jump start your career into Angular! I was appreciated by my manager and recognized as the employee of the month. This is all because of the Angular 6 training session that I attended in Houston. The training helped me develop dynamic model-driven forms that are easier to unit test. I must thank the trainer who has guided me the long way. The economy of the city of Houston is based on the energy industry that is the oil industry in particular. However, the biomedical research, health care, IT and the aerospace also contribute significantly to the economy of this city. The thriving IT industry has created job opportunities for the Angular JS developers. Learn Angular JS training in Houston at Zeolearn. It is known for offering a wide variety of accredited courses in Angular JS, Hadoop, Python, PhoneGap for the IT, marketing and administration field. Expertise of how to lead web-development projects in an organization and clarity on the basics like two-way data binding and filtering. Usage of angular-translate and angular-UI. Basic understanding of the core concepts of the Angular JS framework by the online classroom training sessions. 20 hour course with captivating hands-on-training sessions offered by instructors with one-on-one training at competitive course fees. Enjoy the advantages like anytime access to classroom recordings and the opportunity to join future batches for clarification of doubts or missed classes. Enroll for the Angular JS online course in Houston on the weekdays or weekends at your convenience from your home. With the help of a good internet connection, laptop, smart phone or computer, connect to the live training courses offered by the adept instructors. 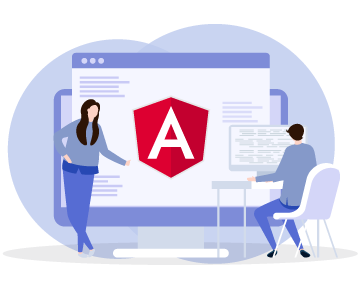 To ensure that you would be able to lead Angular JS based web development projects for organizations you are working at through the practical-based mini projects. To help you to create the custom filters, controllers and custom directives. To understand the concept of the Angular JS framework through query solving. This course is beneficial for the web developers, project managers, software architects, testing professionals, students etc. It is for all the professionals having the expertise for client applications. Pay the most reasonable Angular JS training costs in Houston for one-on-one training sessions. We even offer live training sessions for the corporate teams. Knowledge of the Java Script basic framework. Experience of programming and idea of HTML. Knowledge of the CSS, which saves a lot of work as it controls the layout of the multiple web pages at once. Contact us right away to schedule Angular JS training in Houston at the earliest. Call us for further queries.